The lead changed three times over the course of the Monday night's series opener against the Red Wings game, but a late-inning home run by Rochester was what sealed Buffalo's fate at Frontier Field. The Red Wings scored three unanswered runs to rally past the Herd 4-3. After a solo homer from Xavier Avery and a tying RBI ground out from Jon Berti, the Bisons took a one-run lead in the top of the third inning. In the fourth inning, Buffalo would take advantage of a struggling Taylor Rogers. Following three straight lead-off singles and the bases loaded, Rochester walked Josh Thole. Jonathan Diaz would bring in another run with the help of a sacrifice fly to right, scoring Andy Burns and taking the 3-1 lead. It didn't take long for the Red Wings to retaliate. In the bottom of the fifth, Rochester's James Beresfold hit an RBI double to left field to cut the deficit to one. Reynaldo Rodriguez would drive in another run for the Red Wings to tie the game. Jose Martinez sent a deep solo homerun over to left field to bring home the go-ahead run for Rochester. Although Bisons' starter Randy Wolf earned his second loss of the season, the southpaw was impressive through seven innings of work. Wolf struck out seven batters before being relieved by Aaron Loup in the eighth. 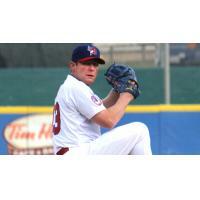 The veteran lefty is still tied for most wins with the Bisons this season (nine wins, Copeland). The Bisons continue their road trip against Rochester on Tuesday at 7:05. Prior to Monday's matchup, the Blue Jays announced that they would recall Matt Hague back to Toronto. With 161 hits on the season, #MattVP has six more hits than any other player in all of affiliated baseball, Major Leagues and minor leagues. Hague leads the International League with a .348 average (35 points higher than next closest)... Toronto also announced that they optioned RHP DREW HUTCHISON and LHP Aaron Loup to the Bisons... RHP Gregory Infante also was transferred to the Fisher Cats.